SJ Bradley: Short Story Workshop Ideas are Everywhere! 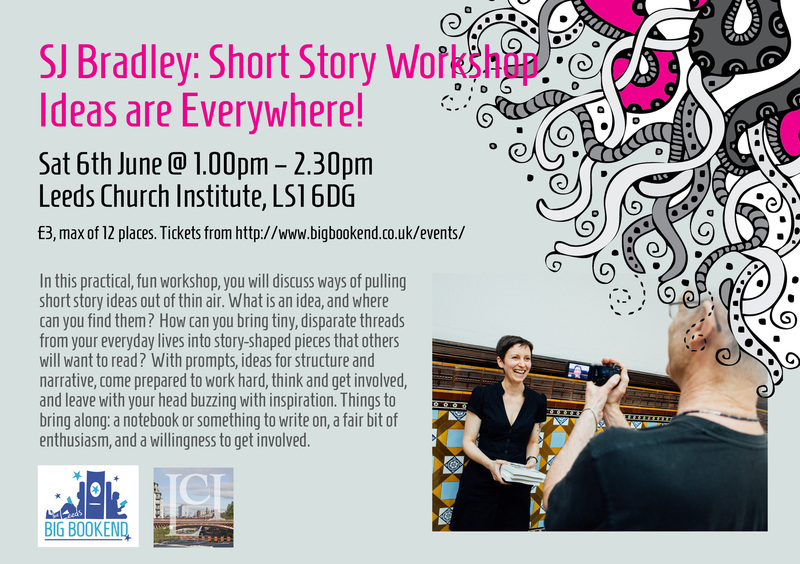 SJ Bradley: Short Story Workshop, Ideas are Everywhere! In this practical, fun workshop, you will discuss ways of pulling short story ideas out of thin air. What is an idea, and where can you find them? How can you bring tiny, disparate threads from your everyday lives into story-shaped pieces that others will want to read? With prompts, ideas for structure and narrative, come prepared to work hard, think and get involved, and leave with your head buzzing with inspiration. Things to bring along: a notebook or something to write on, a fair bit of enthusiasm, and a willingness to get involved. SJ Bradley’s short fiction has appeared in December magazine, Untitled Books, the LS13 anthology, and Toasted Cheese. In 2013 she was shortlisted for the Willesden Herald prize and her novel, Brick Mother, is published by Dead Ink Books. She is the curator & organiser of Fictions of Every Kind, a Leeds-based non-profit literary social.